Cool Running is an iPhone game in which the star of the show is a penguin who’s probably the most popular and most lovable animal known to man. The app was released by Innoace Co. for an iPhone, iPod Touch, and iPad and costs $0.99. 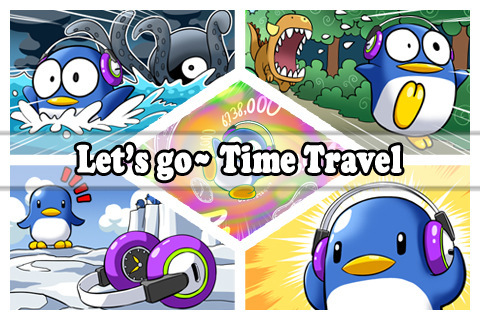 Although the title of the app conjures up images of bobsledding on a tropical island, it is actually about a penguin traversing time. Our little penguin is playing in the arctic one day when he picks up a pair of headphones and puts them on not knowing that they would take him from his happy home and dump him into an eerie time continuum where he has to fight his way back to the South Pole. He journeys across a series of tiles in an attempt to move from level to level until he is hopefully, eventually, deposited back home. The penguin is controlled by touching the screen at the place you want him to go. When you have safely guided him to the correct tile labeled ‘goal’ he falls through and gets taken to another level. 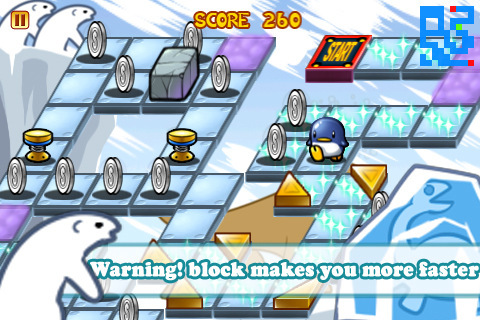 The beginning of each level is marked by an anecdote shown through an image of the penguin experiencing the most current place that he is visiting. There are five themes and 100 levels to play with names like, Jurassic Age, Ice Age, Sailing Age, Western Age, etc. You start with Jurassic Age and the others are locked until you have completed enough levels in that Age to get yourself to the next place in time. You can throw out cushions to guide or block the penguin’s path at any time. This would not be an app game detailing adventure without the use of coins, so as the levels increase so do the opportunities to get your cute little winged friend some money. I had a hard time managing the penguin’s movements and not because I am technologically challenged but because of the subpar design of the controls. It was difficult to get into the game and enjoy it when I could not seem to master the controls. Aside from the minor detail of not being able to play properly, I found Cool Running to be adorable. AppSafari review of Cool Running was written by Vanessa Paszterko on February 17th, 2011 and categorized under Action, Adventure, App Store, Arcade, Games. Page viewed 4148 times, 1 so far today. Need help on using these apps? Please read the Help Page.